Energize an outdoor party, play your favorite music on a hike, or grab your tablet and watch a movie at the campsite. Bluetooth speakers offer impressive audio, go with you anywhere, and can even be paired together for a bolder sound. Plus, water-resistant Bluetooth speakers let you enjoy your music around the pool, on the boat, or at the beach without having to worry about the elements. 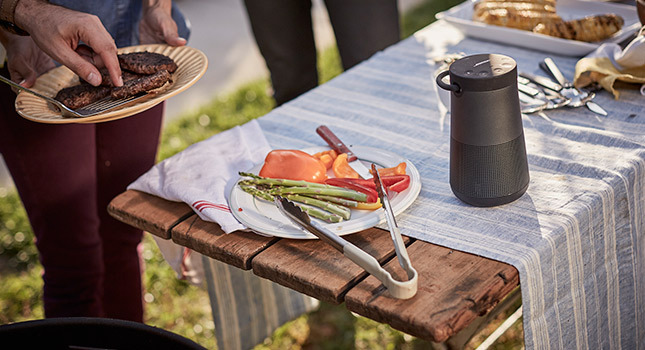 Be ready for an impromptu party in the park, relax with an inspiring playlist on the deck, and enjoy crisp, clear audio when you're listening to a podcast. Bluetooth speakers come in a variety of colors, sizes and styles, so you can find the right match for your unique lifestyle. Listen to music on a long bike ride, enjoy clear sound while you watch TV shows and movies, or finish an audio book while you work around the house — all wirelessly and without interruption. Water- and weather-resistant speakers expand the places you can go — whether you clip on a speaker while hiking or biking, or bring one to the beach, the ballgame or camping. Bluetooth speakers are small without sacrificing sound quality. Even with their compact size and easy portability, they're designed with built-in amplifiers to deliver full-range audio whenever you want. Connecting a speaker to your smartphone, MP3 player, tablet, portable game console or laptop is easy with Bluetooth technology. Some wireless speakers can even connect to each other for a richer, more developed sound. You won't need special apps or hardware to use this technology as long as both the device and audio system are Bluetooth-enabled. However, there are apps available for some speakers to help make the experience more user-friendly. You can also find some wireless speakers that use Wi-Fi or AirPlay. Combines great sound with Amazon Alexa, Google Assistant or Microsoft Cortana voice assistant. So, along with streaming music from your mobile device, you'll have your own personal assistant to get you the latest news, order a product or operate other smart home devices just by using your voice. Choose a wireless speaker that can keep pace with your active life by surviving stormy weather, spilled drinks, and drops into puddles. From the pool to the beach to all your outdoor adventures, a water-, dirt- or weather-resistant Bluetooth speaker will keep the playlist going wherever you are. Some models are even submersible, so they are able to survive an accidental plunge into the pool or the lake. If you aren't near an electrical outlet, you can still charge your device via some portable speakers. Using the battery power of the speaker, a built-in USB port allows you to plug in your charger — so you can maintain power on the go. Amplify your listening experience with portable speakers that can pair directly with each other. This is especially helpful when you want to share audio with a group of people in an outdoor setting where sound needs to travel. With a speakerphone setting, you can easily take calls from your phone. Offering another layer of convenience, the feature is perfect for conference calls and anytime you don't want to miss a call. Speakers with this feature usually fade out audio streaming when the phone rings. Stay entertained wherever you are, from a party to the pool to your own backyard. Bluetooth speakers make it easy to listen to music, watch movies, play games and more, whether you're traveling, heading outside, or staying in. Portable speakers are available in a variety of weights and shapes, designed to be packed in a bag, stowed in your pocket or carried by an attached handle. You'll even find speakers with pulsing lights that add extra ambience to your audio. Plus, optional covers and cases make for a custom listening experience. Find a wide variety of Bluetooth speakers on BestBuy.com. 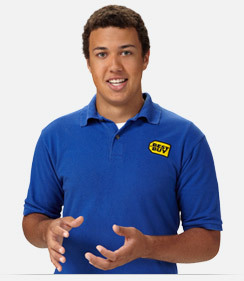 Your local Best Buy store also has a selection of wireless speakers. Plus, our friendly Blue Shirts are there to answer questions and help with choosing the best Bluetooth speaker for your needs.